Hopefully somewhere on this post there is a picture of a zombie who has been reflecting on his learning. However, getting the picture on the blog was not as straightforward as I anticipated because I was determined to do it without using a computer. Stage 1: create a photo, add a caption and speech bubble. I downloaded a free app onto my Android phone called ComicStripIt. 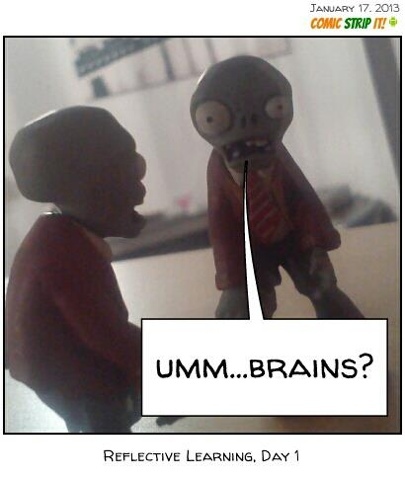 Using this app I took a photo of my slightly puzzled looking zombie, added a caption at the bottom, added a speech bubble and moved it around until I was happy with it then saved it and shared it on Facebook. Stage 2: upload my captioned zombie picture onto this blog. I switched from using my phone to the iPad and opened up Facebook so I could retrieve my picture. I don't use the Facebook app on the iPad (I prefer the web version) so I logged on using the Safari browser, found my photo (complete with a couple of comments from my friends) and saved it to the iPad photo gallery. So far so good. I then opened up Blogger, created a new post and tried to add a photo. However, there was no option to add a photo from the gallery. Never mind, thought I, as I returned to using my phone, I'll do it this way and sure enough from the web version of Blogger I had the option to added a photo from the phone gallery. However, there was no option to save the picture from the ComicStripIt app to the phone photo gallery. Hmm. So I used What's App to send the picture from the comic app to a friend, then tried to save it from within What's App to the photo gallery. No joy. So I am now back on the iPad having downloaded the free (and very basic) Blogger app and I think it has added the picture from the iPad gallery but I can't see where on the page it ill be. So I will now publish this post then switch back to the web version to see how it looks!